Hi there! 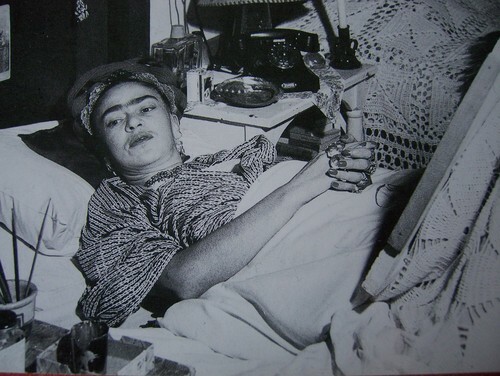 I was wondering if you happen to know a source for ordering prints of photographs of Frida Kahlo. I’m specifically interested in finding “Frida on White Bench”, but am having no luck. Thanks! of Art. They’re currently on exhibit in Aurora, Illinois. 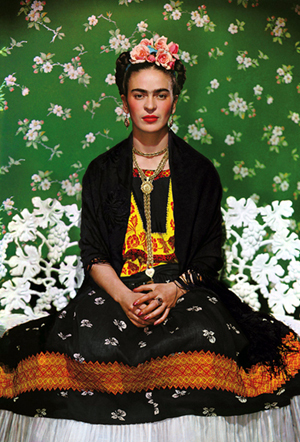 The promo image for the exhibit: “Frida Kahlo: Through the Lens of Nickolas Muray” happens to be the one you are seeing: Frida on a White Bench. Meg Bero, the Director of the Native American Museum at the Aurora University, gave me the name and contact info for the company that put together the exhibit, Smith Kramer, Inc. Although they do not own the copyrights to the photos, they can put you in touch with someone who can give you rights and permissions to reproduce images. Contact: Ann C. Jones, Smith Kramer, INc. at either 816-756-3777 or 800-222-7522. Silvia, I don’t have the info you seek but you are free to email me at lisarogers224@austin.rr.com. I’ve play a game on my blog each Tuesday where I get my readers to compare two pieces from the same artist and comment in 30 words or less either comparing them to each other, or to their own life. 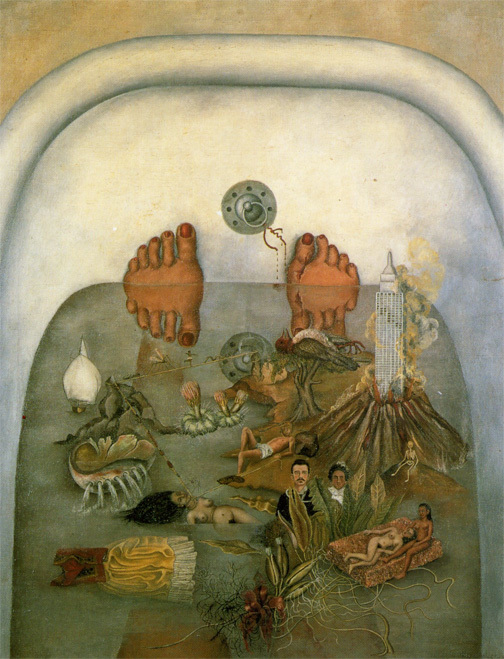 Today I chose Frida and it has been interesting to read the responses. She still has the capacity to polarise! One of my readers recommended your site and I’ve enjoyed reading interesting facts about Frida that I didn’t know before. Have you read Barbara Kingsolvers book ‘The Lacuna’? Frida and Diego along with Trotsky feature heavily. Thanks for all that you’ve shared here, it’s one of the most informative sites I’ve found. I will check out your link. I am so glad you found something fun to read at Lisa’s History Room. I had not read abt the possibility of Frida having spina bifida, but I have read more than a few times that her pain may have been exacerbated by Fibromyalgia. The FMS would have come on as a post- traumatic illness from the streetcar accident or the following surgeries. As a paraplegic on knee high leg braces and a cane for 30 years now, I can only begin to understand the anguish she went through with the surgeries, casts, treatments and medications available fifty years ago. Add the right leg already weakened by polio. After years of ambulating in an able- bodied world the polio survivor’s muscles in the weakened areas can’t do it any more. It’s called post polio syndrome. For example, I walk as a paralytic, I have Lyme Disease + Fibromyalgia, and I’m looking forward to a hip replacement as my body is breaking down as a paraplegic. So I guess what I’m saying-in to many words- that polio + plus the horrible body damage, 30 surgeries, the circulation breaking down in the leg- is enough to be in anguish. The gal didn’t need spina bifida or Fibromyalgia to feel any worse. And self medicating with self delivered morphine and brandy it’s also probable that her tolerance had gotten so high taking morphine, etc for so many years that adding a bit more- or not- to the syringe- her heart just gave out, weakened by all the body’s torments. i also have had Polio with a few of Fridas complaints..Chronic foot/back pain,ulcers..I am on the verge of getting an amputation myself as Im so sick and tired of being in pain..I really understand her anguish.I also paint mainly because its one of the only physical pleasures still open to me.Great informative site by the way. Thank you this was so helpful. I don’t know what I would have done without you Lisa!